-Match number 547 for Denmark and number 501 for Yugoslavia. -This was the eighth meeting between the nations. - Yugoslavia’s previous victory as well its previous match at Copenhagen was a World Cup Qualifier in the same stadium on September 9, 1981 that Yugoslavia won 2-1. Yugoslavia player: Zlatko Vujovic was only player still remaining from that match. -The previous match between the two nations was a 5-0 Denmark win on June 16, 1984 during the UEFA European Championships in Lyon, France. Denmark players: Sivebaek and Michael Laudrup and Yugoslavia players: Ivkovic, Katanec, Vujovic, Bazadarevic and Susic were the players still remaining from that match. 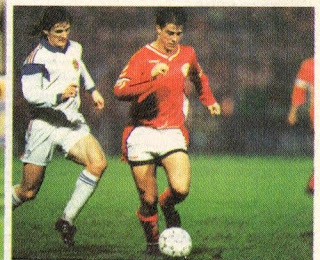 -The next match between the two nations would be the return leg of this UEFA European Championship tie in Belgrade on May 1, 1991 that Denmark won 2-1. Denmark’s Schmeichel, Sivebaek, Kent Nielsen, Lars Olsen, Bartam, Jensen and Vilfort and Yugoslavia players: Ivkovic, Vulic, Jarni, Najdoski, Spasic, Hadzibegic, Jozic , Pancev and Bazdarevic were the players still remaining from that match. Ilia Najdoski came on as a substitute in both matches. -About eight months after this match, on June 23, 1991, former Yugoslav provinces of Slovenia and Croatia declared independence from Yugoslavia, which started the civil war. -After the break-up of Yugoslavia, Katanec played for Slovenia, Jarni and Boban played for Croatia, Pancev and Najdoski played for FYR Macedonia. -Red Star Belgrade stars Dejan Savicevic and Robert Prosinecki were unavailable for this match. -Yugoslavia won its third straight match in this Euro qualifying group, they would go on to win 7 out of 8 matches, only losing the return fixture of this leg to Denmark. -Yugoslavia would qualify from this group. However, due to the ongoing Civil War in Bosnia, UN sanctions were applied and just before the start of the tournament Yugoslavia was excluded from the Tournament Finals. Denmark replaced in them and went to win the title. -Katanec, Susic and Zlatko Vujovic earned their last caps for Yugoslavia. Starting 1991, Yugoslav manager Osim started replacing the old guard with new younger players specially those of Red Star Belgrade. -Red Star players Pancev and Najdoski went on to win Champions Cup at the end of that season vs. Olympique Marseille of France. - On November 20, 1990, Brothers Michael and Brian Laudrup and Jan Bartram withdrew themselves from further selection while Richard Moller-Nielsen is in charge. Jan Bartram said he would like to make way for younger players. Michael Laudrup said he no longer had any enthusiasm. Brian Laudrup said he lacked respect for the manager. All three would eventually come back; Bartram was the first to come back in the spring of 1991. Brian Laudrup returned by early 1992 and finally Michael Laudrup returned to the national team in the fall of 1993. Michael Laudrup in interviews cited as one of his reasons, the defensive tactics of the new manager. Denmark had been playing an attractive, offensive game for a decade under previous manager the German Sepp Piontek. -This was Denmark’s first home loss in an official tournament qualifier since the September 9, 1981 loss to Yugoslavia in Copenhagen. -Denmark’s Michael laudrup and Yugoslavia’s Pedrag Spasic both played for Spanish giants Real Madrid in their career. Denmark’s Fleming Povlsen was on their nursery team Castilla for one season. Robert Jarni also played for Real Madrid but by then he was a Croatia international player. Both Jarni and Michael Laudrup also represented Italian Club Juventus in their careers. -Yugoslavia’s star Dragan Stojkovic missed this match through injury. He was injured shortly after joining Olympique Marseille and never really gained full fitness that season. He missed all of Yugoslavia’s matches for the season. -Both Yugoslavia’s players Zvonimir Boban and Mehemt Bzdarevic had returned to national team duty that season after serving suspensions. Mehmed Bzdarevic had spat on the referee during a World Cup Qualifier (October 11, 1989 vs. Norway 1-0) and on October 25, 1989, was banned for international football for one year. On February 2, 1990, FIFA announced that Mehmet Bazdarevic was banned from the World Cup for spitting at referee in Norway match. On May 24,1990, Zvonimir Boban was suspended for the Zagreb riot, where he had fought with policemen during the Yugoslavia Cup Final between Dinamo Zagreb and Red Star Belgrade. -Safet Susic assumed captaincy for Yugoslavia after Vujovic was substituted. -On June 16, 1996 during the UEFA European Championships in Sheffield (Hillsborough Stadium), Croatia defeated Denmark 3-0. Denamrk’s Schmeichel, Vilfort and brothers Michael and Brian Laudrup and now Croatia players Boban and Jarni played in that match. Boban scored one of Croatia’s goals. -Safet Susic is the current manager of Bosnia and Herzegovina. -A month prior to this match on October 17, 1990, Croatia played its first match since World War II by defeating USA 2-1 in a friendly. Zoran Vulic played in that match as well. The Croatian Robert Prosinecki, the new star of Yugoslavia (Who was abscent for the Denmark match), had not taken part in that match, since Croatia was still not officially recognized by FIFA. -Darko Panvcev was replaced in the 11th minute due to injury. -This was Denmark’s last match at Copenhagen’s Idrætsparken Stadium. From 1992 they would play their official matches at Copenhagen’s Parken Stadium. Denmark’s first match at this stadium was in 1912. By scoring vs. Faroe Islands in the previous match in this stadium, Povlsen became the last goalscorer of the stadium.